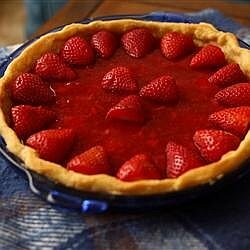 I offer many different variations, including fresh strawberry pie, French strawberry pie and more below. This recipe call for a regular pie crust, but it is also delicious with a homemade graham cracker crust. This recipe also works beautifully with raspberries or peaches; just purchase raspberry or peach Jell-O instead of the strawberry Jell-O. If you really want to impress your guests, make this in my famous chocolate pie crust - they will ooh and aww. Make my homemade whipped cream and top with chocolate covered strawberries and chocolate shavings. Seriously, this is impressive. Poke the crust with a fork and bake the pie crust in a 375 degree oven until it is light brown in color. Cool. Mix the cream cheese and powdered sugar together and place on the bottom of the cooled crust. Slice the strawberries and layer over the cream cheese mixture. In a medium saucepan combine the Jell-O and cornstarch; add the water and sugar. Cook over medium heat until boiling; stirring often. Pour this mixture over the strawberries. Place the pie in the refrigerator for a minimum of 4-5 hours, or until the Jell-O glaze sets. Serve with whipped cream. Delightful homemade strawberry recipe, isn't it? Wash berries and drain well on paper towels. Combine in saucepan: 2 cups berries, sugar, cornstarch and baking powder. Mash berries with potato masher. Cook over low heat, stirring constantly until smooth and thick; approximately 8 minutes. Set aside to cool. Arrange remaining berries in the cooled pastry shell; pour cooled mixture over berries. Refrigerate several hours. Before serving, cover top with thick layer of whipped cream, sweetened with vanilla. Place strawberries, sugar, egg whites, lemon juice, and salt in a mixing bowl. Beat at medium speed for 15 minutes (yes, 15 minutes), or until stiff. Whip the cream, add vanilla and fold into strawberry mixture. Pile lightly into baked shell. Freeze for several hours or overnight before serving. Some of these recipes call for red food coloring (which I do not use). The India Tree Natural Decorating Color - True Red uses vegetable colorant (no chemicals or preservatives). Make crust out of crumbs and 1/3 cup of butter; pat into pie plate. Cream remaining butter and powdered sugar; add beaten eggs and vanilla. Beat until fluffy and spoon into crust. Mix dream whip according to package directions and fold strawberries into the dream whip. Spoon over egg mixture and sprinkle with additional graham cracker crumbs. Refrigerate until firm. Wash and stem strawberries. Simmer 1 cup of berries with 2/3 cup water. Blend sugar, cornstarch and remaining water. Add to boiling mixture, stirring constantly, until mixture thickens. Add the remaining whole berries and cool. Blend cream cheese with the powdered sugar and liqueur and spread on the bottom of the pie shell. Top with cooled strawberry mixture. Chill at least two hours. Garnish with homemade whipped cream. This old fashioned strawberry pie recipe brings back memories. Line the bottom of baked pastry shell with fresh strawberries, saving 10 for the top (or more). Mash the frozen strawberries and add enough water to make two cups. Add the sugar and cornstarch and cook until thick. Dissolve the gelatin in 1/4 cup cold water and add to hot mixture. Add food coloring for a rich red color. Pour the cooled glaze over the strawberries; put in refrigerator until set. Serve with whipped cream and garnish with the reserved berries. Mix sugar and cornstarch together. Add corn syrup and water. Bring to a boil and cook for 6 minutes. Add Jello-O powder and red food color (if using); cool mixture. Wash, stem and drain berries and place in 9 inch baked pie shell. Pour cooled mixture over berries; store in refrigerator. Serve with whipped cream. 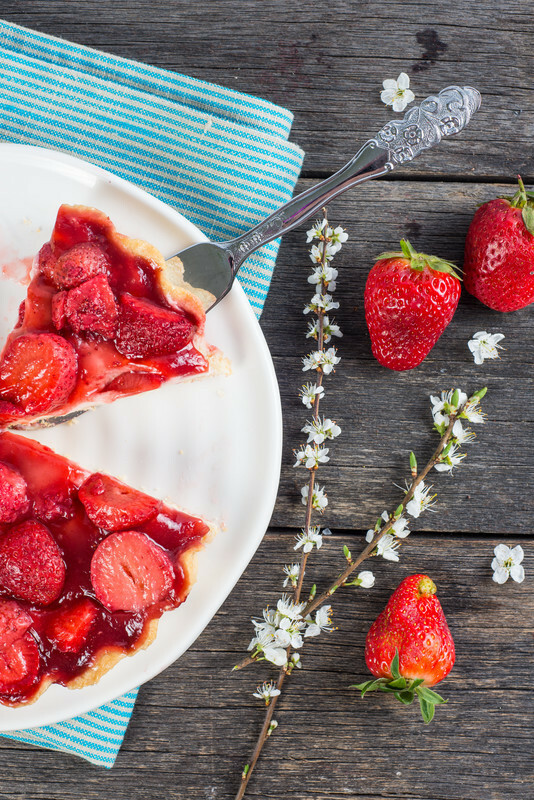 You will enjoy this fresh strawberry pie recipe. Combine 1/2 cup sugar, 3 TBS cornstarch, flour and salt. Gradually stir in milk. Bring to a boil, stirring constantly and cook until thick. Stir a little of this hot mixture in with the egg to proof it. Mix together and add egg mixture back into the hot mixture. Bring to a boil and cool completely. Chill and fold in whipped cram and vanilla. Fill pie crust with creamy filling. Crush remaining berries, add water and cook for 2 minutes. Put through sieve. Mix remaining sugar and cornstarch; gradually stir in berry juice. Cook and stir until thick and clear. Add food coloring; cool slightly. Spoon mixture over berries and chill until time of serving. Top with additional whipped cream. Garnish with a few whole berries. If desired, 1/2 cup sliced toasted almonds may be used to line the bottom of the cooled baked pie crust.